Artist continues exploring her Utah surroundings. From Stephanie Leitch's "Untitled Apogee"
Artworks tend to include the imprint of the personality and social development of the artist, on some level or another. For installation artist Stephanie Leitch’s new work “Untitled Apogee” at the Utah Museum of Contemporary Art, the shape of the work itself took on a kind of psychological geography. Specifically, it’s an artistic reaction to the LDS culture of Salt Lake City, where she was raised. As she describes it, “I come from a postmodern Western state formed out of the desert by utopian hands. Our valley bowl is marked by the same hand, divided and structured in a defined moment in an idealized grid. My brain is ingrained with this rigid grid; my subconscious can replicate its contours. Leitch has exhibited a number of installation works, most recently “Untitled Congregation” in April 2013 at Nox Contemporary, consisting of 6000 LDS Sacrament cups full of water, arranged on the floor of the gallery. Her fascination with Mormon symbology is due to its mix of the sacred and the mundane. 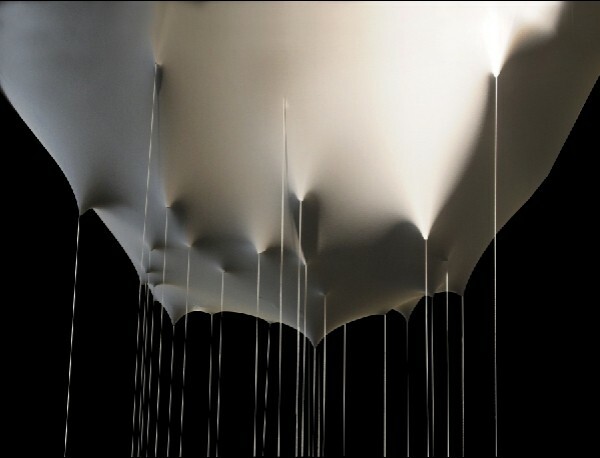 For “Untitled Apogee,” she uses fabric, string and video projections to create a topography of the area, suspended from the ceiling to create an inverted map of 617 steeples of the Mormon chapels and temples in the Salt Lake Valley, extended down to the floor. Her body of work is remarkable in its unity of theme and style. This work is a continuation of a series that began with the piece “Untitled: Fielding,” in which she repurposed covers of used LDS priesthood manuals featuring a portrait of the bearded Joseph F. Smith that were headed to the recycle bin. “That was the first piece which directly drew upon a specific relic of LDS material culture and re-appropriated it for aesthetic ends,” she recalls. “Untitled Apogee” may have its closest parallel among Leitch’s other works in “Untitled Edifice,” in which she projected video of other pieces of LDS architecture, inverted and lowering themselves onto the facade of then Ephraim-based CUAC, itself a historic pioneer building. Upcoming works will look at different aspects of these issues. A May installation at the Salt Lake City Library, she says, will be exploring horizontality as opposed to verticality.